Julia Barretto says that she now shares a better relationship with her father Dennis Padilla. Actress Julia Barretto shared that she now has a better relationship with her father, actor Dennis Padilla, during the bloggers’ conference for the upcoming teleserye, A Love To Last. “Good. We’re actually good. Actually, my whole trip in Japan, kausap ko lang siya. We’re better now,” she said. Julia celebrated the New Year with her mother Marjorie Barretto and siblings Dani, Claudia, and Leon in Japan. The young actress also said that her father has seen her movie Vince and Kath and James. “Happy siya sa film at saka sabi niya, happy akong i-share ‘to, kasi sabi niya happy daw siya sa performance ko. 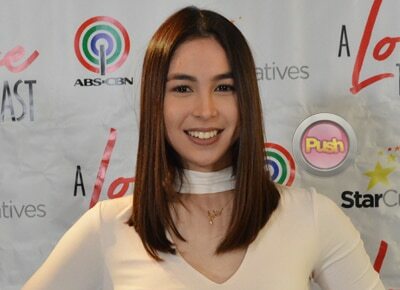 Kasi comedy ‘yun, di ba?” Julia said of her comedian father’s reaction. “Siyempre baka mataas ‘yung standards ‘nun sa comedy pero natuwa naman daw siya sa film. At saka, gustong gusto niya ‘yung lesson ng film,” she added.